Bringing a whole new level of charm to Crozet, quite literally, Piedmont Place is a new development right in the heart of Downtown. 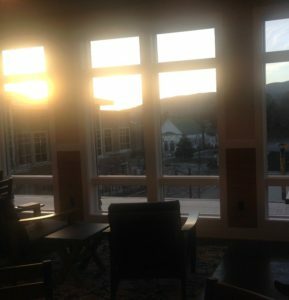 The building is situated right across the street from Crozet’s library and boasts one of the highest elevations in the town, which provides unmatched views of the Blue Ridge Mountains. In its three stories, Piedmont Place combines modern amenities with timeless architecture and seamlessly combines residential and commercial spaces to create one unique, modern atmosphere for residents of Crozet and beyond. This mixed-use structure offers four high-end residential apartment units within its confines. Each apartment features a spacious balcony overlooking either the charming atmosphere of Crozet Square or the Blue Ridge Mountains. Inside, luxurious finishes meet spacious two-bedroom floor plans to give residents ample space to spread out. Energy-efficient initiatives, including solar panels and WaterSense plumbing fixtures, allow residents to enjoy their spaces with minimal impact on the environment. Keeping with Crozet’s spirit of supporting local businesses, Piedmont Place offers commercial spaces for local artisans, fantastic restaurants, stores and more. Visitors to the development enjoy a book store and craft shop, Over the Moon Bookstore & Artisan Gallery; a craft beer and wine company, Blue Ridge Bottle Shop; a smoothie shop, Smojo; a highly inspired to-go eatery, Morsel Compass and an ice creamery, which sources all its ingredients locally, Crozet Creamery. The commercial spaces are modeled after the famed Chelsea Market, which allows customers to have easy access to all the units and store owners to be connected with one another. The building also houses two restaurants: Smoked Kitchen and Tap and The Rooftop. Smoked Kitchen and Tap has actually been in the area for years, but in a different form – a food truck. The establishment of the sit-down barbecue restaurant location allows Crozet’s residents to enjoy the Charlottesville favorite any time they desire. Heading up to the roof of the building, The Rooftop – an extension of Smoked Kitchen and Tap – offers a trendy, lounge-style atmosphere that is complete with delicious food and drink offerings and awe-inspiring views of the surrounding mountains. Sure to become a favorite night spot for locals, The Rooftop also offers cozy blankets and space heaters to enjoy the ambiance at any time of year. Perhaps one of the most unique features of Piedmont Place is its yoga studio, Santosha Yoga. This space within the building offers quiet tranquility and plenty of room for workshops, regularly scheduled classes and a variety of other offerings to serve the community. 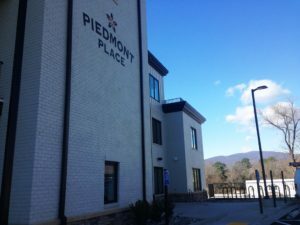 With all of the new amenities Piedmont Place provides, it is no wonder that the residents of Crozet anxiously awaited its opening in 2016. 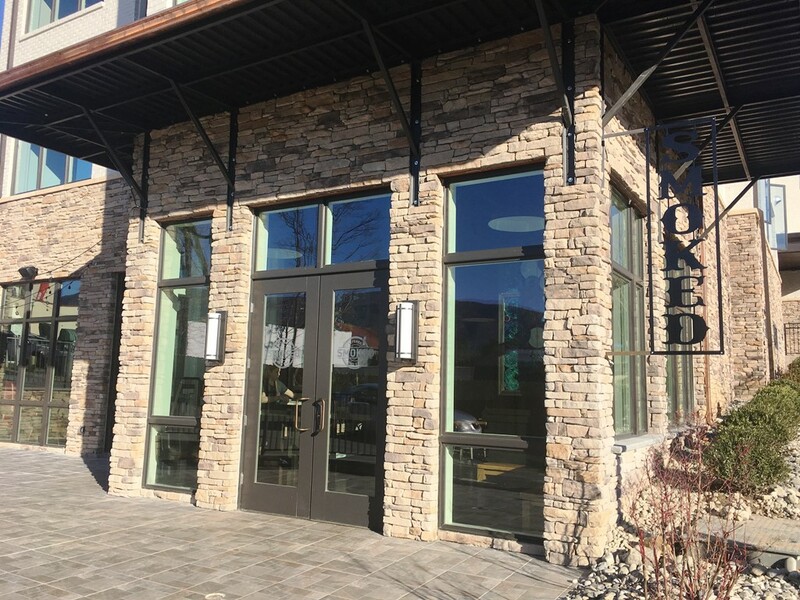 The big-city modeling of this building is the perfect fit for this cozy town, as it puts many local businesses in one place – a continuation of Crozet Square. Crozet Pizza, Mudhouse Coffee and several other local businesses are within walking distance of Piedmont Place, giving residents the full package Downtown. Come see what Crozet and Piedmont Place have to offer, or contact us to join the Crozet community yourself.